We would like to announce that this is our last publication cycle until fall 2014. Also, it’s become somewhat of a Pleiad tradition for the editor-in-chief to write lessons learned at the end of his or her term. After six semesters on staff as a staff writer, copy editor, managing editor and editor-in-chief, I’m kind of announcing my retirement. The Center on International Education Exchange accepted me to study French and research my thesis in Dakar, Senegal next semester. 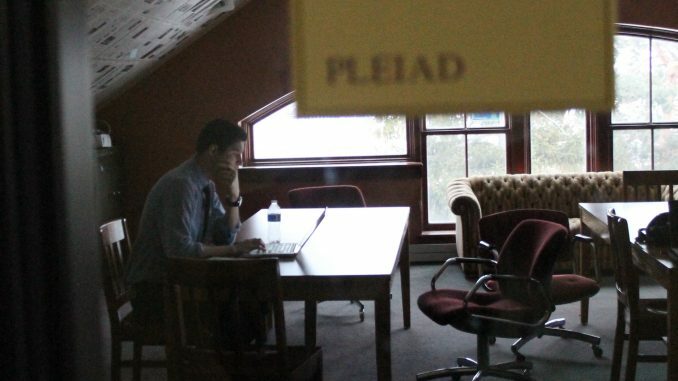 Many senior staffers are graduating, too, so The Pleiad is reorganizing. This is a good time for a new editor-in-chief to transition into the position. The staff is most likely hoping that a French and biology student won’t be managing English and communication majors anymore. My time serving on staff has been my most rewarding experience at Albion College. When I signed up on the quad at Briton Bash during my freshman year, I didn’t expect that this job would change my college career. It gave me the chance to build my resume, write over 45 articles, improve my communication skills and network on campus. The other staffers will continue to be my best friends long after we leave the office and graduate from Albion College. The Pleiad dates back to 1883, and I am so proud to have played a part in that history. Since I joined the staff, our student publication has made great strides. We’ve continued to improve our website, develop mobile platforms, create advertisements, implement journalism workshops, expand staff policies and win awards. Though there have been great successes, we can still be better. Dr. Ditzler has already started to foster a relationship with the staff. My hope is that he recognizes the need for a better journalism program at Albion College. The new president, the next editor-in-chief, the adviser, the Albion College Media Board and the English department should work closely to build more opportunities for students to learn. According to the Pew Research Center, the number of national news outlets are on the decline, and “this adds up to a news industry that is more undermanned and unprepared to uncover stories, dig deep into emerging ones or to question information put into its hand.” As an academic institution, Albion College needs to prepare students now to be equipped for those future careers in reporting. I have no doubt that the new editors will keep moving us in the right direction. That said, I’m not sure what my next move is after The Pleiad. Hopefully I can contribute as CNN’s chief medical correspondent or write as the Paris correspondent for GQ. Anyways, if I’m not remembered for the moratorium, hopefully it will be for my knit ties and cardigans. Enjoy the summer, and we’ll see you next fall. Go Brits! Congrats from ab old Pleiad editor. (1970).